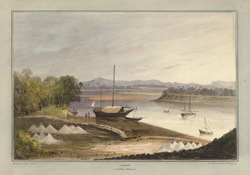 Coloured lithograph of Kalyan in the Northern Konkan in Maharashtra by Rudolph Ackermann (1764-1834) after an original drawing by Captain James Barton (1793-1829). Plate 3 of Captain James Barton's '12 Views of Hill Forts in the Western Ghats near Bombay' published in London in c.1820. The ancient maket town of Kalyan is situated about 30 miles to the north-east of Bombay. The English founded a factory in Kalyan in 1674 and seized the town in 1780. The artist, Captain James Barton, was an artillery officer who served in the third Anglo-Maratha war in 1817-19.